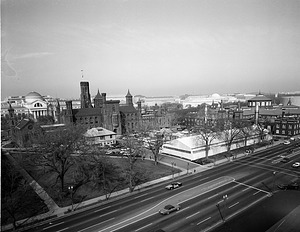 The South Yard behind the Smithsonian Institution Building, the Castle, is bordered on the east by the Arts and Industries Building and west by the Freer Gallery of Art. In the late 19th century, it was the site of small buildings for the Smithsonian Astrophysical Observatory, Taxidermy Studio, National Zoological Park, and Aerodrome Studio. 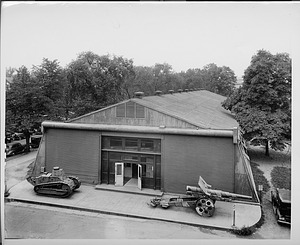 After World War I, a Quonset hut housed the National Air Museum (today, the National Air and Space Museum), next to the Radiation Biology Laboratory (today, the Smithsonian Environmental Research Center) greenhouses. 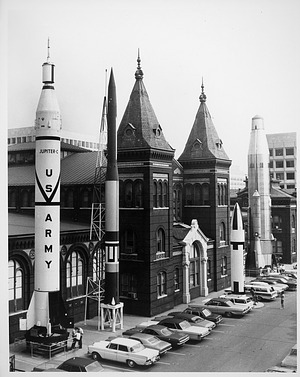 By the 1960s, “Rocket Row” along the Arts and Industries Building’s east side showcased the latest in space technology. In 1976, the South Yard was converted to a Victorian Garden to welcome visitors. 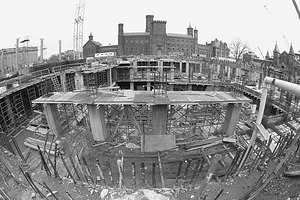 In the 1980s, the area was excavated to create the Quadrangle Complex, with underground buildings for the National Museum of African Art, Arthur M. Sackler Gallery, and S. Dillon Ripley International Center. Pavilion entrances to these buildings are nestled within the Enid A. Haupt Garden. 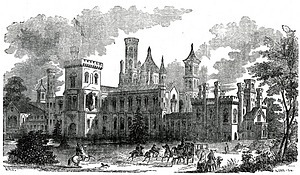 Engraving of the Smithsonian Institution Building (SIB), or "Castle," south facade from the southeast with rich background of trees, shrubs and sky, with lots of activity as visitors travel to and from on foot and by horse and carriage. The engraving was published in the Guidebook of 1857. 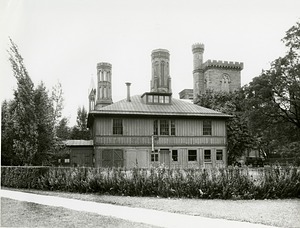 South Shed (also referred to as the Annex), built in 1898, was used for the preparation of exhibition specimens, and later as the "Bug House." Demolished in the fall of 1975 in preparation for the Victorian Garden which opened in 1976. Part of the Smithsonian Institution Building is visible behind the Shed. 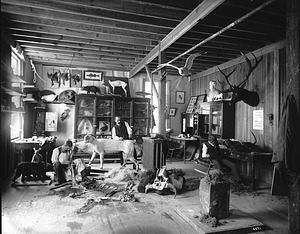 In the interior of the model and taxidermy shop, which was located in the South Yard behind the Smithsonian Institution Building, around 1880, William Temple Hornaday (center), taxidermist and zoo keeper, is working on a tiger mounted for exhibit and Andrew Forney is working on the tiger skin. On the far right is another man seated at a desk working on a specimen. Other mounted animals line the shelves. Skulls and animal skins are scattered throughout the room. 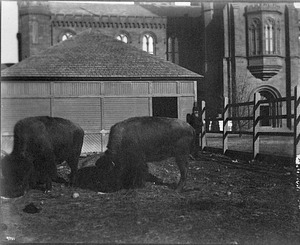 Two buffalo are in a paddock in the South Yard behind the Smithsonian Institution Building. They were acquired in 1886 by the United States National Museum's Department of Living Animals, which eventually became the National Zoological Park. This photograph, taken sometime between 1886 and 1889, predates the founding of the NZP which was established by Act of Congress in 1889. 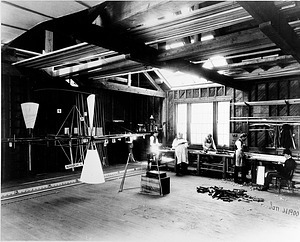 Samuel P. Langley's Aerodrome Shop in South Shed built in 1898 and located in the South Yard behind the Smithsonian Institution Building. Samuel P. Langley (1834-1906) was an astrophysicist and third Secretary of the Smithsonian Institution (1887-1906). He was also founder of the Smithsonian Astrophysical Observatory. He did research in aeronautics and attempted to build the first manned flying machine. The Smithsonian Astrophysical Observatory located in the South Yard behind the south facade of the Smithsonian Institution Building. The Astrophysical Observatory is enclosed by a wooden fence. The Annex, also called the South Shed, is behind the Observatory. 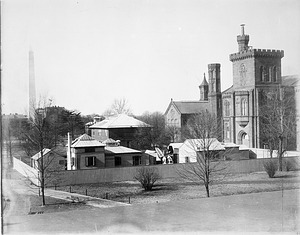 The Laboratory of Natural History, the old Agriculture Building, and the Washington Monument are visible in the background. 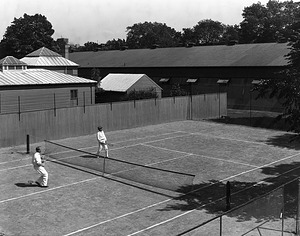 Loyal B. Aldrich of the Smithsonian Astrophysical Observatory (1908-1955) and Astrophysicist Charles Greeley Abbot (Fifth Secretary of the Smithsonian, 1928-1944) playing tennis behind the Smithsonian Institution Building, next to the Smithsonian Astrophysical Observatory, in the South Yard. The National Air Museum Quonset Hut is in the background. Quonset Hut behind Smithsonian Institution Building, the "Castle," in the South Yard built in 1917 by the United States Signal Service for use during World War I. The shed was transferred to the Smithsonian in 1919 and served as the National Air Museum, now the National Air and Space Museum, for many years. It was demolished in 1975 in preparation for the Bicentennial of the American Revolution, Victorian Garden. In front of the Quonset Hut is a French made Renault tank and a German howitzer. 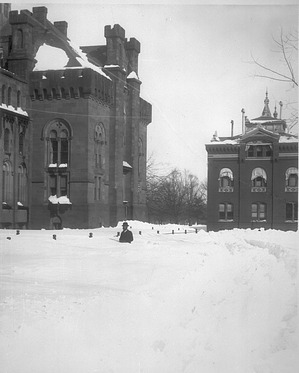 The Smithsonian Institution Building, Arts and Industries Building and the South Yard after a snowstorm. View is from the South Yard looking east. A Smithsonian employee is standing in snow that is chest high. 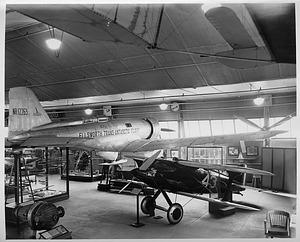 A Lincoln Ellsworth's Northrop Gramma "Polar Star" and a Curtiss R 3C-2 racer, in foreground, exhibited in the Aircraft Building located in the South Yard as part of the National Air Museum, now the National Air and Space Museum. There is also exhibit cases with models of airplanes and part of airplanes. 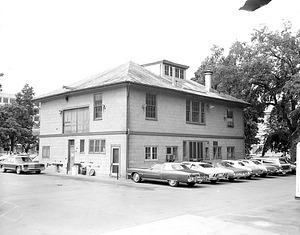 The South Shed in the South Yard, 1975. The South Shed, built in 1898, was used as Samuel P. Langley's Aerodrome Shop and later it was used for taxidermy. It has also been referred to as the Annex and later, as the "Bug House." It was demolished in 1975 in preparation for the Victorian Garden which opened in 1976. View of the South Yard taken from the roof of Forrestal Building (Department of Energy) shows the skyline of downtown Washington, D.C. Smithsonian buildings visible include the Smithsonian Institution Building (SIB), and the Arts and Industries Building (A&I). In the South Yard are the National Air Museum, "Rocket Row" along the west side of the Arts and Industries Building, the South Shed, and various other sheds. The National Gallery of Art west building is also visible in the background. 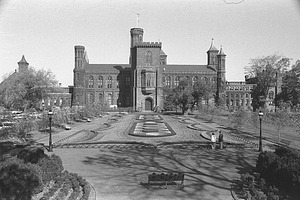 View of the Victorian Garden in the South Yard looking north towards the Smithsonian Institution Building, October 15, 1976. The design, developed by the Office of Horticulture, is based on the horticultural displays at the 1876 Centennial Exhibition in Philadelphia. Looking from the Independence Avenue side of the Quad construction. The floor will eventually be the roof of a 10,000 square foot, two-story high exhibit gallery. Photo shows Freer Gallery of Art, Smithsonian Institution Building and Arts and Industries Building in background and was taken with wide-angle lens that has made an interesting distortion. 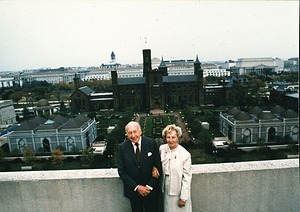 Smithsonian Secretary S. Dillon Ripley standing with his wife, Mary Livingston Ripley, on the roof of building across from South Yard. 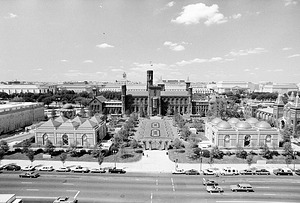 Aerial view shows Smithsonian Institution Building (SIB), Enid A. Haupt Garden, National Museum of African Art (NMAfA) (right) and Arthur M. Sackler Gallery (AMSG) (left).